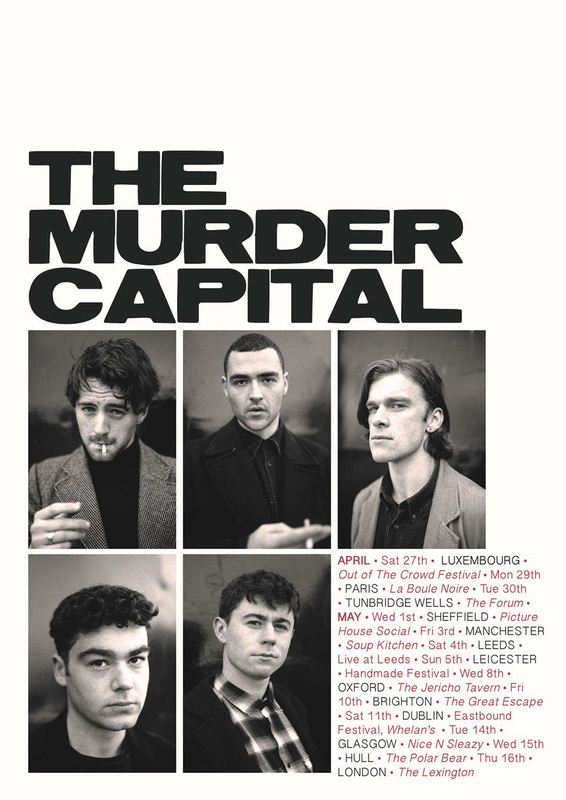 After selling out numerous UK dates before any studio material was even available online, Dublin’s The Murder Capital today announce a further string of dates for April and May that include dates at The Great Escape, a London headliner at The Lexington and a homecoming show at Whelan’s in Dublin for Eastbound Festival. The Murder Capital ended 2018 as that rare thing: a band tipped from all corners without having released a single song. In an age where people and bands overshare by default, The Murder Capital have been doing the opposite. If you wanted to know about The Murder Capital, you had to get to a show and see for yourself. That’s if you could get in. Based on the caustic strength of one live recording of “More Is Less”, which went viral on YouTube (watch), and feverish word of mouth from those who have been lucky enough to attend these early gigs, The Murder Capital have built a formidable reputation. In just over a year, they’ve sold out shows in their hometown of Dublin (to 400 people), played with Slaves, Shame and fellow countrymen Fontaines DC and seen the likes of the NME, Loud & Quiet, Dork and DIY back them already – with The Irish Times calling them out as Ireland’s best new rock band. With debut single “Feeling Fades” the band fulfill their early promise – delivering a brooding, propulsive slice of post-punk recorded with Flood (PJ Harvey, Nick Cave & The Bad Seeds, Foals). In one of their rare interviews so far, the band have stated they are driven by the genuine desire to affect cultural change, and when front-man James McGovern repeats the lyric “the now elapsed ‘round you and me, and it kept us all together” on this, their debut single, you start to believe that they’re capable of achieving just that.